love the rocks! !great composition too! Fantastic! Love the blue sky and the way you did that!! Great sketch. Definitely not a practice. I just googled images of a lighthouse becauseI am leading a team on a Mission Trip to Mexico in March. We would like to make t-shirts for the team so we can keep track of each other in the airports! 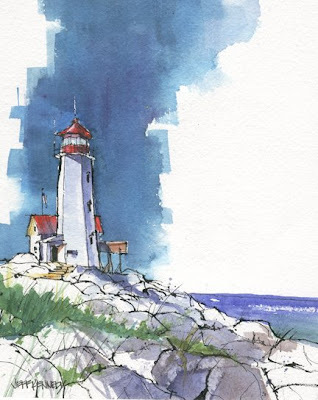 I love you painting of the Peggy's Cove lighthouse and I was wondering if I could have you permission to use that image on our t-shirts.